Wales Arts International (WAI) is delighted to announce that Hijinx theatre, a portfolio client of the Arts Council of Wales, is this week signing an agreement with AC Orange, one of China’s largest performing arts companies. 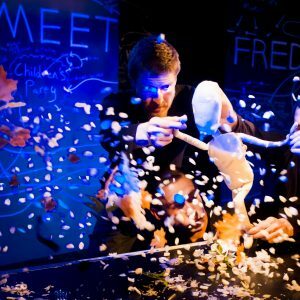 The deal will see the award-winning inclusive theatre production of ‘Meet Fred’ tour China in May 2018 – the latest collaboration in a growing cultural and arts partnership between China and Wales. 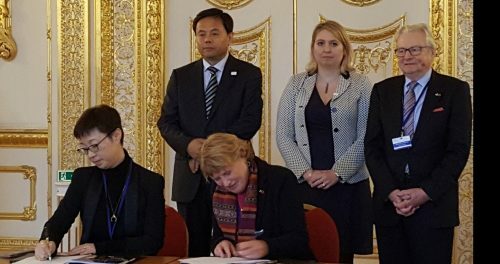 The formal signing of the agreement took place at the UK-China High Level People to People Summit at Lancaster House on Thursday, 7 December 2017, and was witnessed by Dr Liu Yandong, Vice-Premier of the People’s Republic of China and Dafydd Elis-Thomas, Welsh Government Minister of Culture. The agreement is a direct result of a 2015 cultural Memorandum of Understanding between the Government of Wales and the Cultural Ministry of China. “This agreement shows that Wales’s cultural collaboration agreement with China is bringing significant economic and cultural benefits to both countries and is a glowing tribute to Hijinx theatre and its pioneering work. Hijinx are pioneers in the training of learning disabled adults to become professional actors. They also tour contemporary theatre productions with casts that always include learning disabled actors. 2017/18 will see them touring to 67 cities in 16 countries over 4 continents. Hijinx also provide bespoke role play training to the public and private sector to help staff improve their communication with vulnerable people. 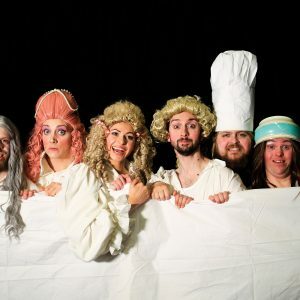 They transform communities with their extensive youth, education and outreach work and host an annual international festival bringing together the best professional disabled performers in the world to Wales. 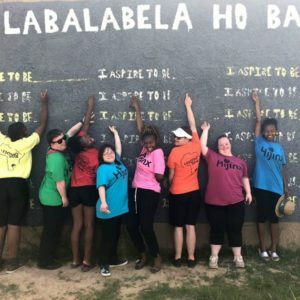 In February 2018 they will take four learning disabled actors to Lesotho, Africa for the first time. AC Orange is the largest private performing arts company and the second largest chain of theatre management in China. They are producers, presenters, ticket vendors and investors. Yu Qun, Deputy Minister of Culture for the People’s Republic of China; Karen Bradley, UK Government Secretary of State for Culture; Lord Dafydd Elis- Thomas AM, Welsh Government Minister for Culture, Tourism and Sport Minister for Culture Welsh Government. Seated: Yao Cheng, Director AC Orange ; Clare Williams, Hijinx. The agreement signed with AC Orange has four potential phases. The first, already agreed, will see the company tour its award winning ‘Meet Fred’ production to Shanghai in May 2018. The next phases will be to recreate the show with a Chinese cast, to invest in Hijinx’s 2019 production, and ultimately to jointly develop the Hijinx Academy model in China. Hijinx Theatre participated in a Welsh Government Trade and Culture Mission to China in February 2017 which was crucial in securing the deal for the company. Hijinx are not alone in breaking new ground. Since signing a co-production agreement at the People to People event in Shanghai in December 2016, Cloth Cat Animation (Wales) and Magic Mall (Beijing)’s animation series Luo Boa Bei has been released in China and has had 50 million views in the first two weeks. It has created work for 45 people in Cardiff. 9 Story are the international distributors of the series which was launched in MIPCOM with great interest from broadcasters. More companies from Wales will be seeking new work in China as part of the second Welsh Government Trade and Culture Mission to China from 10-17 of March 2018, to coincide with the Welsh National Opera’s performances at the Hong Kong Festival. The Wales National football team will also be playing in the China Cup later that week. Meanwhile in Wales, the inaugural China-Wales Festival in Pontio, Bangor on 16-18 February will mark Chinese New Year with performances by The Gentle Good and Invertigo theatre, readings by writer Francesca Rhydderch and the second workshop by WAI to support companies to work in China.